Stallion Publisher is a professional blog and content management system, comparable to Wordpress or Drupal. Stallion has a strong separation between the technical user developing the site, and the end-user who is creating pages and blog posts. The developer can build a site using modern best practices. Write templates using a great templating language -- Jinja. Install and manage plugins via the command line. Manage configuration via text files. All this can be controlled via git, and deployed using a staged roll-outs with zero-downtime deploys. Meanwhile, all such configuration is hidden from the end-user, who just has to worry about writing great content. Plugins are sandboxed to keep your site secure. Competing CMS's are constantly getting hacked or face data breaches because of poorly coded plugins. Stallion plugins are sandboxed by default. That means they only have permissions they are granted when installed. Even if there is a coding mistake, the plugin cannot access your data or take over your site. A text editor built for the web. Typical what-you-see-is-what-you-get editors are all lies when it comes to the web. Stylesheets mean that text can appear very different on a live page. The editors also generate terrible markup, making it very easy to have poor styling. On the other hand, markdown is often hard for people to use. Stallion gives the best of both worlds by using a markdown editor with a toolbar and live preview. This means you have great markup, an easy to use editor, and you always see exactly what your content will look like. 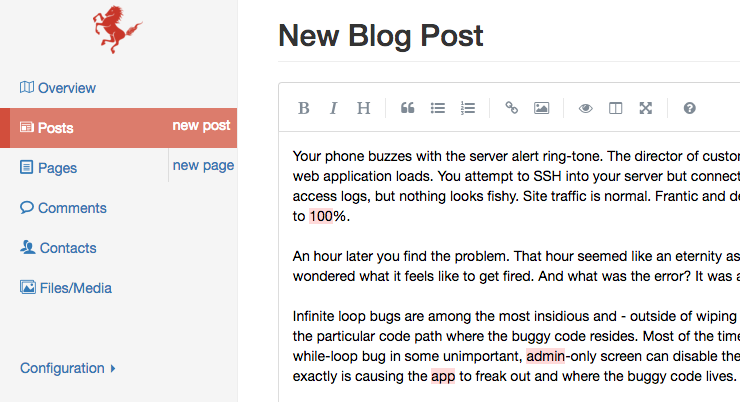 Normal blog engines make it very easy to kill your site with a bad for-loop. What is intuitive, can kill performance. Stallion makes intuitive code high performance code.